I ascend Devil’s Slide: 2,000 feet in 2 miles. 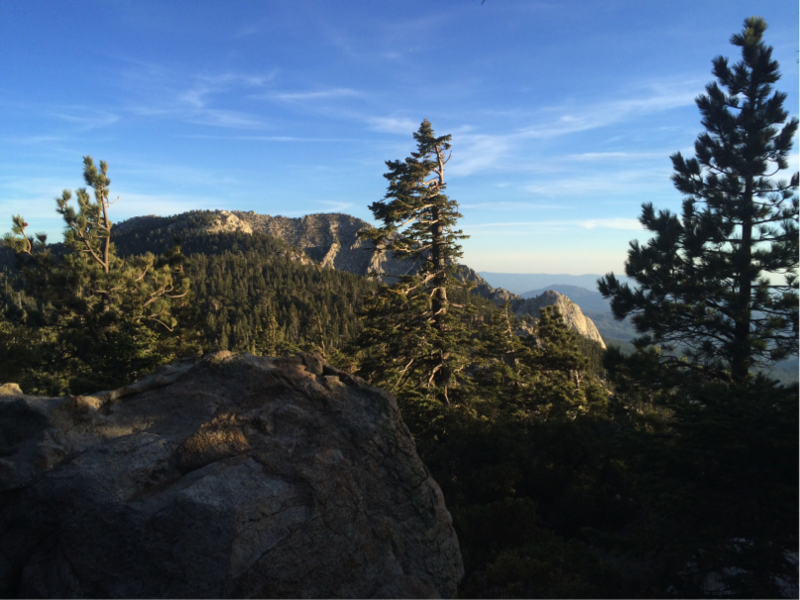 It’s magic hour and Tahquitz Peak looks extra formidable in this light. Even though I’m loaded down with food from my Idyllwild resupply, I feel light and fast. I make it to the top of Devil’s Slide in time to watch the sun simmer behind the mountains. I pass up an amazing camping spot because I feel so good. It’s quickly getting dark, though, and I check my maps for the next camping spot. It’s still quite a ways ahead. I probably should have opted for the one I passed up. Now it’s dark and I’m wearing my headlamp, trying to navigate the signs posted for San Jacinto Peak, the PCT, Deer Springs…. it has me confused. Added to that are the blow downs from yesterday’s wind storm – huge trees that are now lying directly in my path. I have to navigate circuitous routes around them. Hiking, and more often slipping, on the loose dirt and pine needles, looking for the best route with only the glow of my headlamp to light the way. I make it though this gauntlet and find a spot for the night. Overlooking the lights of Palm Springs, I feel solitary, animal, and very much alive. 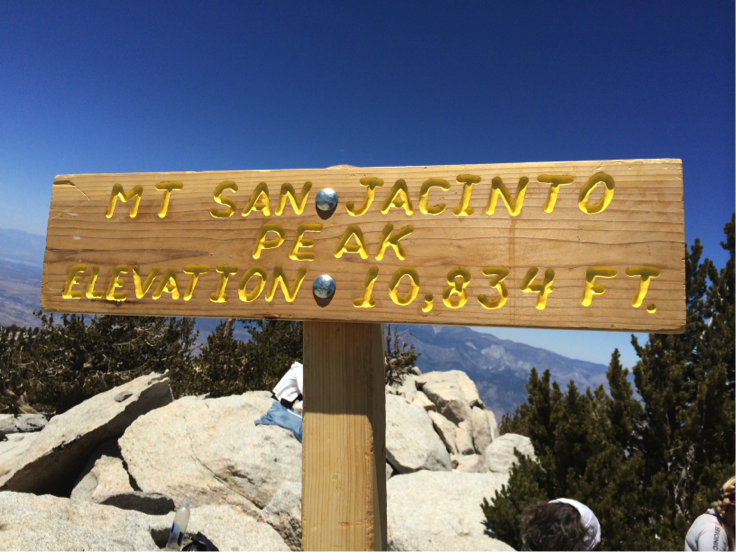 The next morning I pack up my things and decide to summit San Jacinto. I’m here and it’s seemingly so close – only 2.5 miles away. Before I ascend, I stop to fill all my water bottles. I’ll have to dry camp and the next day – descending Fuller’s Ridge – there won’t be water for 20 miles. I find a stream with crisp water and take 6 liters. My pack feels like its filled with sloshy bricks. When I get to the San Jacinto trail, I stash my pack in some bushes, grab a bar and some water and “slack pack” up the 2,000 feet to 10,834 feet. It’s taking me what seems like forever. The elevation is making it harder. I feel slightly drunk and I’m afraid of loosing the trail. I stop a couple of times to shake off the woozy feeling. I drink almost all my water. I know this isn’t a good idea, but it makes my head feel clearer and I’m able to climb the boulders to the peak. The view goes on forever. I can see Palm Spring, the entire Coachella Valley, all the way to the Salton Sea. 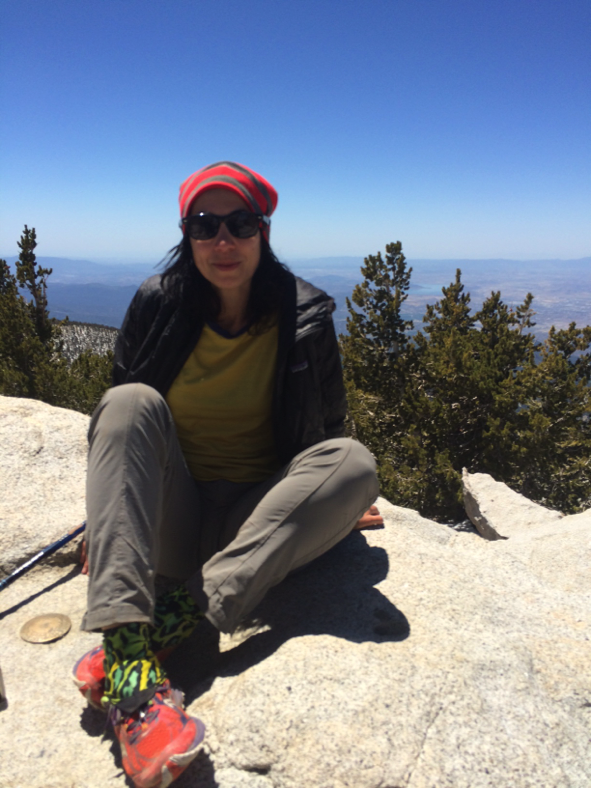 At the summit, hikers are eating “real” food. All I have is my bar and some gummy stars. I eat them, but they don’t even dent my hunger. I photograph my 3D rock for the day, and descend. Just below the peak, I pass a day hiker who has gallons of water in his pack to strengthen his legs. He asks me if I want some before he pours it out. What luck! I fill my water bottle and immediately drink half. It’s taken me a lot longer to do this little summit detour and now I have to hike in the heat of the day. Fuller’s Ridge is dusty and rocky. I’m in a dusty and rocky mood and feel like my legs require more energy than usual to carry me half the distance. It’s 6pm and I find a campground. While I set up my tent, I put on Blue Nile by Alice Coltrane and I’m transported to someplace soft and beautiful. This entry was posted in Transmissions and tagged alive, peak bagging, San Jacinto. Bookmark the permalink.